Kenan, G. (Director). (2009). 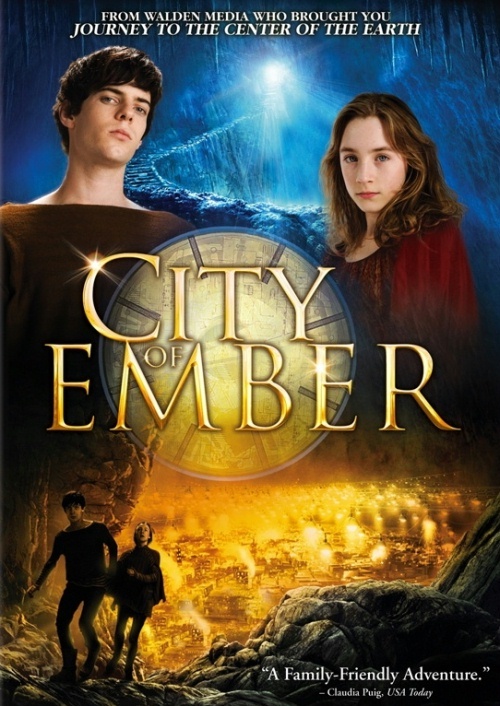 City of Ember [Motion picture]. United States: 20th Century Fox. Everyone is literally afraid of the darkness in the movie City of Ember based on the first book of the Books of Ember by Jeanne DuPrau. They live in fear of the lights extinguishing as the generator fails. The city was created by the Builders, a team of scientists and engineers that hoped that building an underground city to escape “the end of the world” mankind would survive and future generations may be able to live in an environment not knowing of the devastation on the Earth’s surface. As time goes on in the city of Ember beyond the Builders’ desired 200 year plan, the generator begins to fail, the food is running low, and the city’s structure is collapsing. Ember has already ran out of time and the box with directions to exit the city is lost after the seventh Mayor and when found it’s purpose is unknown, the fate of Ember is left to two teenagers, Lina and Doon to save themselves and all of mankind. As Lina and her friend Doon piece together the puzzle of how to escape from what’s left of the scraps of directions by the Builders, they gather whatever information they can as they begin working in the community after their completion of school. Lina is a messenger and Doon a pipeworks technician, and the two highly inquisitive and observant friends discover clues on wall, floors, and two plastic keys, one in Lina’s possession and the other in the Mayor’s. Together, knowing that leaving their city is against the law, they still plan their escape. The path begins with the technician lockers (rafts in disguise) in the Pipeworks to the Generator room where the water meets with the river and ends at a staircase leading to the Earth’s surface. As Lina and Doon escape from the generator room to the outside of Ember it may seem reminiscent to some of an amusement park log ride. I am glad to know that matches will remain enough in tack to still ignite 200 years after a nuclear holocaust… Maybe the theory about Twinkies needs to be reconsidered. On the Earth’s surface, the two are initially despondent as they see only darkness, unaware of the difference between night and day growing up underground with only artificial lighting. When the sun rises, Lina discovers the sky is blue as she imagined in her drawings and together they discover a crack in the Earth from which they can see Ember and send a message tied to a rock to all the other inhabitants with directions how to leave. The characters include; Lina Mayfleet (Saoirse Ronana), descendant of the seventh mayor of Ember who found a box with directions from the Builders how to exit the city. Poppy (Amy and Catherine Quinn) is the little sister of Lina. Doon Harrow (Harry Treadaway), closest friend to Lina Mayfleet, conspires to escape Ember. Loris “Barrow” Harrow (Tim Robbins), Doon’s father and close friend of Lina’s father that died in their attempt to escape Ember many years prior. Sul (Martin Landau) a narcoleptic loony pipeworks technician that’s in charge of training Doon, and Clary (Marianne Jean-Baptiste), a greenhouse worker and friend to Lina’s father end up being Lina’s and Doon’s greatest aids in their escape to the Earth’s surface. And, Ember’s current Mayor, Mayor Cole (Bill Murray) hides the impending doom of the city from its inhabitants as he hoards food and plans his own escape. City of Ember was rated a 6.4 by IMDb and a 53% by Rotten Tomatoes, yet a review by Teen Ink states that the movie was “quite impressive”. The city itself appears similar to the overly crowded and filthy living during the 19th century British industrial Revolution as seen in films based off of the work of Charles Dickens such as Oliver Twist (2005) or the PBS Masterpiece Classic, The Tales of Charles Dickens. Thought the first part of the movie may seem a little dull, the overall story, set design, action in the second half, and actors/actresses makes this a film appealing to those of all ages, particularly tweens since DuPrau’s Books of Ember are considered middle-grade novels. The quest to save the lives of others and following clues may remind older viewers of the movie The Goonies or a more recent film such as The Forbidden Kingdom.